quality and availability of afterschool and expanded learning programs. As part of its ongoing work, NYSAN promotes the inclusion of youth with disabilities in OST programs. Promoting inclusion means treating youth with disabilities as similarly to those without disabilities as possible, ensuring a welcoming and supportive environment for all students. 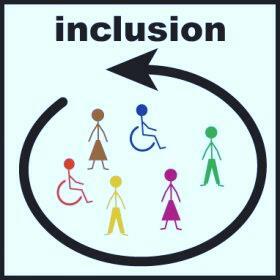 In many situations, inclusion simply requires sensitivity to the needs of individuals–a mindset which is important to working with all youth, whether or not they have a disability– rather than any major changes to the program structure or space. However, in certain cases, the needs of individuals with disabilities may require OST programs to implement a more individualized set of practices and program modifications to allow youth to access and actively participate in the programs and services offered. * The Special Needs Inclusion Project (SNIP) (http://www.snipsf.org/tips-tools/) has developed an “Inclusion Tool Kit” (http://www.snipsf.org/wp-content/uploads/2011/08/v2010Inclusion-Tool-Kit-Sept-update1.pdf) for afterschool programs. * The Advocacy Center’s Together Including Every Student (TIES) program (http://www.advocacycenter.com/together-including-every-student-ties), based in Rochester, New York, provides a short training for student volunteers on interacting respectfully and supportively with students with disabilities and then organizes activities for all students to participate in together. * Kids Included Together (KIT) (http://www.kitonline.org/), offers fee-based, self-paced online professional development. “Promoting the Inclusion of Children and Youth with Disabilities” (http://www.bostnet.org/wp-content/uploads/2014/05/Inclusion-Guide.pdf) for afterschool professionals. comfortable environment for students with disabilities. afterschool, expanded learning, and out-of-school time opportunities. The Hours of Opportunity: Key Elements of Out-of-School Time System Building. Helping Youth Succeed Through Out-of-School Time Programs American Youth Policy Forum (2006). Afterschool Alliance. (2014). America After 3PM. Washington, DC: Afterschool Alliance. Retrieved November 1, 2014, from http://www.afterschoolalliance.org/AA3PM/. Kleinert, H. L., Miracle, S. A., & Sheppard-Jones, K. (2007). Including Students With Moderate and Severe Disabilities in Extracurricular and Community Recreation Activities. Teaching Exceptional Children, 39(6), 33-38. Promoting Middle School Success Through Innovative Afterschool Programs. Washington, D.C.: Afterschool Alliance. 23-35. Retrieved November 1, 2014, from http://afterschoolalliance.org/documents/2014_MetLife_Compendium.PDF. Great information. Growing up, after school activities provided a positive outlet for all my excess energy. Very important for nourishing social skills and developing the mind. I agree after school settings are a great venue to support the principles of inclusion. That is really wonderful and it’s actually a good opportunity for those kind of students who are still willing to learn and still wanted to have a good learning session from their school. It’s a good help for them to have that kind of thing. As a youth with a disability all I wanted to do was play with all my friends with/without a disability. It is great to see that many are having this opportunity. Thanks for your comments.